Sky Digital: BBC Four is back on 10773.00MHz, pol.H SR:22000 FEC:5/6 SID:6336 after a break ( PID:5200/5201 English - FTA). Sky Digital: BBC Four (United Kingdom) is in DVB-S van start gegaan op 10773.00MHz, pol.H SR:22000 FEC:5/6 SID:6336 PID:5200/5201 English - FTA. Sky Digital: BBC Four (United Kingdom) is in DVB-S van start gegaan op 10773.00MHz, pol.H SR:22000 FEC:5/6 SID:6336 PID:5200/5202 nar,5201 English - FTA. BBC & Freesat & Sky Digital: Nieuwe frequentie voor BBC Four: 10773.00MHz, pol.H (DVB-S SR:22000 FEC:5/6 SID:6316 PID:5200/5201 English,5202 English- FTA). BBC Four switched to Astra 1N satellite at 10803.00MHz, pol.H (DVB-S , 10803.00MHz, pol.H SR:22000 FEC:5/6 PID:5600/5601 English,5602 English). 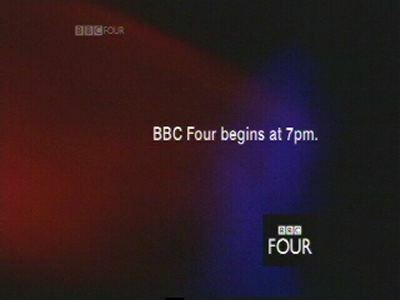 BBC: BBC Four is nu gecodeerd in BISS (11495.00MHz, pol.V SR:44100 FEC:9/10 SID:4544 PID:401/402 English,406 English). BBC: BBC Four (United Kingdom) momenteel ongecodeerd (FTA) te ontvangen (11495.00MHz, pol.V SR:44100 FEC:9/10 SID:4544 PID:401/402 English,406 English). BBC & Freesat & Sky Digital: Nieuwe frequentie voor BBC Four: 10803.00MHz, pol.H (DVB-S SR:22000 FEC:5/6 SID:6416 PID:5600/5601 English,5602 English- FTA). Sky Digital: PID zijn veranderd voor BBC Four op 11720.00MHz, pol.H: PID:2331/2333 SID:0 ( SR:27500 FEC:2/3 - VideoGuard).